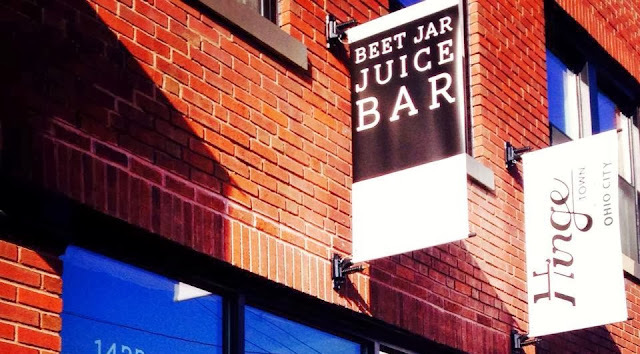 The Healthy Hoff: New Cleveland Vegan Restaurant Alert: BEET JAR juice BAR!!! New Cleveland Vegan Restaurant Alert: BEET JAR juice BAR!!! Not quite ready yet, but sometime this month, BEET JAR juice BAR will unveil its awesomeness to the citizens of Cleveland - hooray!!! BEET JAR juice BAR is an Organic, Raw, and Vegan Food establishment. Vegan-owned and Vegan-operated! Not only will this place be a safe-haven for Vegans, the food will be made with a health-conscious focus. The menu will change seasonal, but feature specialties include Cold-Pressed Juices, Nut Milks, Kale Chipz, Raw Slaw, Pauerkraut, Zucchini Pasta, Spring Rolls, Gluten-free Desserts & more! Starting out completely raw, BEET plans to expand to soups & noodles as well. Come on Cleveland - get out there and support one of our own!